According to Daily Star, Manchester United have submitted a stunning £80m bid for Napoli centre back, Kalidou Koulibaly. The Senegalese international has been identified by Jose Mourinho as the man to help solve his defensive crisis and is ready to sanction a world record move for the 6ft 5in powerhouse. 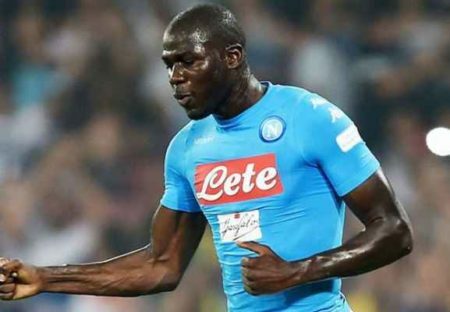 Koulibaly has impressed for Napoli again this season, with Jose Mourinho ready to bring him to Old Trafford. United have had well-documented defensive problems all season, and have conceded a whopping 21 goals in just 12 league games, which is only 7 less than the entirety of last season. Italian publication, La Republica reports that United have launched an £80m bid for the player to try to fix his backline. Mourinho was vocal about the need for defensive reinforcements last summer but none arrived at the Theatre of Dreams as the club failed to secure the rumoured signings of Harry Maguire, Diego Godin and Toby Alderweireld, who were all linked to Old Trafford in the summer. Since arriving in Naples 4 years ago, 27-year-old Koulibaly has become one of Europe’s most sought after defenders, exhibiting an astute reading of the game to constantly repel wave after wave of attack for Napoli. He is a big, powerful centre back who despite his huge frame is mobile, fast and very good on the ball. He has made 174 appearances for the Partenopei, scoring 8 times.